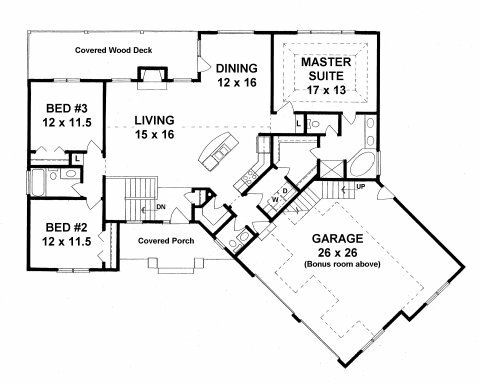 Plan #1683 features a large Master suite with walk-thru closet for laundry convenience. The Holiday size Dining room has atrium doors to a covered deck and the Kitchen features a large open bar and a walk-in Pantry. The Garage is oversized with extra storage areas and an 11' x 20' Bonus room above. Use the modify-plan link or contact form to request a basement image for this plan.